Backed by a big spending plan, the burger chain is targeting faster growth for the year ahead. The past year was a good one for McDonald's (NYSE:MCD) investors. Sure, the fast-food giant returned less than 5%, which might seem disappointing to some shareholders. However, that result outpaced the broader market's decline -- particularly in the waning weeks of 2018, when surging volatility sank many portfolios. It also came with an over 2% dividend yield that was well supported by rising profits. It's anyone's guess what the selling environment will look like in the fast-food industry over the next 12 months, but there are a few things McDonald's investors can be reasonably sure to see from the company in 2019. McDonald's recent results have had a good news/bad news rhythm over the last few quarterly reports. On one hand, global sales are rising at a market-thumping pace, including by 4% in the third quarter of 2018. That metric stacks up well against peers like Taco Bell or Starbucks, who are growing at closer to 2%. However, McDonald's has seen customer traffic decline in the U.S. in each of the last three quarters. Management is planning many of the usual initiatives to get traffic back into positive territory. These include aggressive value pricing, menu upgrades, and limited-time offerings. However, the bigger test will be in its store remodeling strategy. By the end of 2019, the company will outfit its U.S. locations with modern fixtures like ordering kiosks and digital menu screens while adding home delivery functionality. McDonald's believes these changes will accelerate growth, just as they have in international markets like France and Canada. But while the sales boost is unclear, the spending is immediate and concrete. The chain plans to shell out $1.6 billion toward this sales-boosting goal in 2019. 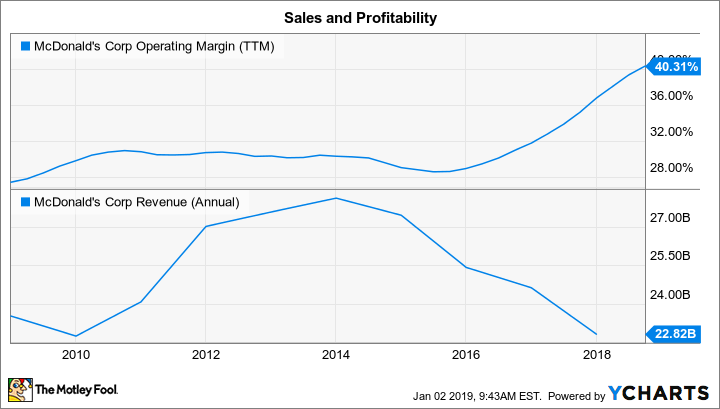 McDonald's refranchising strategy, whereby it sells company-owned locations to franchisees and trades food sales for lower but more profitable franchise fees, rent, and royalties, has been a huge short-term success. By whittling down its proportion of company-owned restaurants from 15% down to 8%, it lowered its annual sales but supercharged its profit margins. Operating margin just crossed 40%, in fact, up from below 30% in 2015. There's more growth ahead for this key metric. McDonald's aims to get its store ownership down to just 5% by 2020, which should help push operating margin into the mid 40% range for the year -- and for the foreseeable future. The chain announced a head-turning 15% boost to its annual dividend last year, and there is likely much more on the way for direct cash returns to shareholders. By the end of 2019, after all, McDonald's will have delivered $25 billion, or about $8 billion per year, to investors since 2016. The metrics that support that hefty return flow include operating margin and return on invested capital, which are among the best in the industry and should continue inching higher in 2019. But the more important figure for investors to watch will be global sales growth. McDonald's is hoping that a modest traffic rebound in the U.S. will help push gains toward the top end of their long-term target range of between 3% and 5%. If that happens in 2019, especially in the context of rising profitability, then management's new cash return plan might be even more aggressive than the one it just completed.